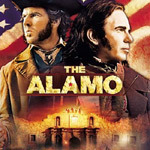 What makes “The Alamo” so disappointing is that its slow pace and inferior battle sequences cause it to go out with a whimper instead of a spectacular thud. What was originally intended to be a gritty R-rated epic directed by Ron Howard and starring Russel Crowe devolved into an also-ran that Disney eventually dumped into theaters and that resulted in huge losses. The better parts of “The Alamo” come in its opening and closing acts when we are introduced to the players and when we see the battle’s aftermath. But these bookend a long and tedious portrayal of the siege, most of it playing as a streched-out scene involving doomed men awaiting their fate. When the action finally arrives, it is too sanitized and too sloppy to hold any interest. As a character study, Billy Bob Thronton’s David Crockett is the only one who shows up for the party. He has the movie’s best demeanor as well as the best lines, some of which are “we’re gonna need more men” and “we’re gonna need a lot more men.” He also acts as a surrogate audience member. He’s the observer trying to survive a tense situation. Crockett stands way above he rest of the characters, including the brooding Sam Houston (Dennis Quaid), the bickering Lieutenant Colonel William Travis (Patrick Wilson), and Jim Bowie (Jason Patric) whose initial conflict over command is resolved too quickly. And despite the fair treatment director John Lee Hancock tries to give the Mexican army, Santa Ana (Emilio Echevarrias) is rendered as Dr. Evil in a Napoleon suit. “The Alamo’s” look and sound have that old-fashioned feel that many period pictures have these days, and none of that is lost on the DVD transfer. Some beautiful photography can be fond in this picture, including some very nice sunset shots. The sound has a level of consistency that is too good for a movie having very this poor music and a soundtrack with not much going on. Three documentaries Return of the Legend, the Making of the Alamo, Walking in the Footsteps of Heroes, and Deep in the Heart of Texas, make up most of the extras, and these look like one big documentary sliced up into three smaller ones just to make the disc look like it has more content than it actually does. All three are superficial looks into the production with very little background on the historical figures involved. Five deleted scenes involve an abandoned back story of Santa Ana’s courtship with a local girl and some extra background on the characters, which Hancock explains in a commentary for time and context, but it looks like it would not have made much difference anyway. The best way to check the historical background is a feature not listed on the keep-case, and that is the audio commentary by historians Alan Huffines and Stephen Hardin. They do an excellent job explaining the intricacies of the production, right down to explaining why Crockett seldom wore his famous cap in person. They understand that certain artistic liberties were taken to make the experience more entertaining but they also point out what they got right as far as historical accuracy, such as the recoil of the canons that are not seen in many other productions. They also explain how the filmmakers wanted to portray these historical personas not as alabaster figures but as flawed people that the audience an relate to. Why did they not promote this? Maybe Disney executives figured that most people never listen to the commentaries anyway. It is the best special feature of the disc, but do they really lack that much confidence in their product that they hide it? The Alamo is not fun-bad like Showgirls or interesting-bad like Heaven’s Gate. It is just dull-bad, and even with the DVD release, Disney will still have a hard time recovering from this one.